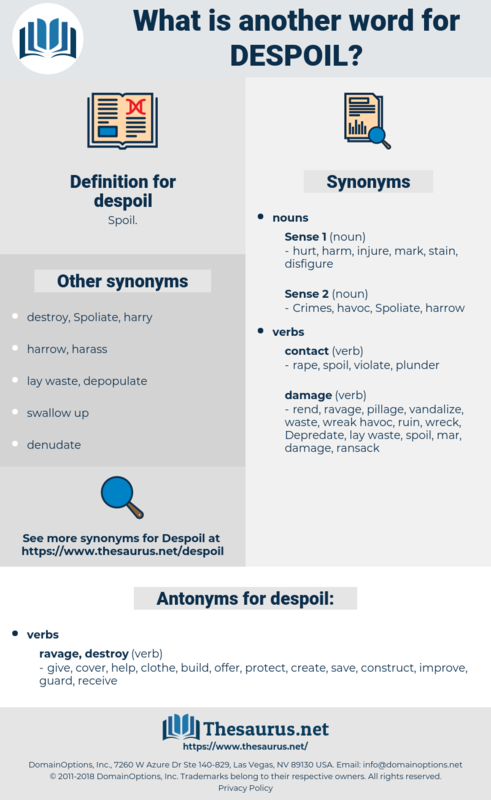 What is another word for despoil? going over with fine tooth comb. give, cover, help, clothe, build, offer, protect, create, save, construct, improve, guard, receive. Spanish troops, as well as the guerrillas under the cruel chiefs Carreraz, Clavarrietta, and Lazo, continue to despoil the country and drench it with the blood of non - combatants. When in Egypt I had a dream which made me fear that my brother Smerdis would despoil me of the empire; I therefore had him executed. 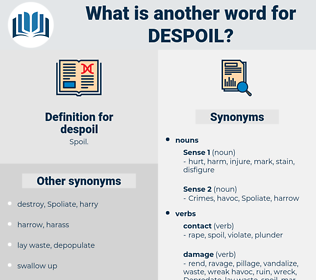 disavowal, decibel, dispel, Dutch people, display, dishful, disavowable, disk file, dishabille, disciple, decisively, dishevel, decayable, duckbill, discocephali, decouple, deducible, dog flea, detachable, dissociable, dog hobble, disable, deshabille.